In just a few days, it will be Christmas. I’m still grading papers, I haven’t baked my usual cookies, and my house doesn’t remotely resemble anything on Pinterest. And yet it doesn’t matter. Really. It doesn’t. For me, this is at heart a sacred season, shared across the global Christian community. As long as I hold on to that, it is easy to let the rest go. When I celebrate creativity at Christmas, one of my favorite things to see is the beauty and variety of crèches (or nativity scenes) created by artists around the world. I’ve written once before about my experiences helping to assemble an enormous crèche display. Today I thought I’d share another display, this one at the University of Dayton Marian Library. Regardless of whether the story of the stable in Bethlehem is sacred to you, take a minute and marvel in the varied and beautiful ways each culture has made the story its own. If you’d like a chance to study the crèches in more detail, the library provides a wonderful link to view individual scenes. 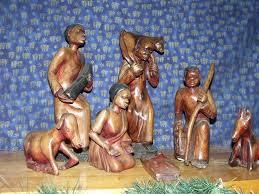 Just click on a country and see a nativity from that culture. And if you’d like one more nativity, how about this one—a world record breaker? I’ve never seen such a collection of angels! Have a wonderful holiday season, my creative friends. Take time to stop, breathe, and enjoy the moment. For today we can be open to experience, enjoy a little play, and be grateful for the things that matter. I’ll be back after the New Year.